Hiya! Hope everyone had a great weekend, here in Australia we had a long weekend which is why this post is coming a little late. As expected, the last week has been completely nuts with the wedding and then a week spent with my relatives visiting from overseas. I am exhausted, but in a good way. The wedding was amazing, A & I had such a perfect day and night and we were so happy to celebrate with all our closest family and friends. Even with all fingers and toes crossed and my Mum doing an anti-rain dance, it poured the entire day and my dress got a little muddy but we didn't let it affect the day at all. I knew my bad luck when it came to the weather, so all our venues were totally under cover, and I had a big pile of cute polka dot umbrellas. Karen was sweet enough to take some amazing photos of the food at the reception at Quay with her shiny new camera, so when I get the chance I'll try to put together a post. These are some of the flowers that we brought back from the wedding, our house was full of lovely smelling flowers all week. 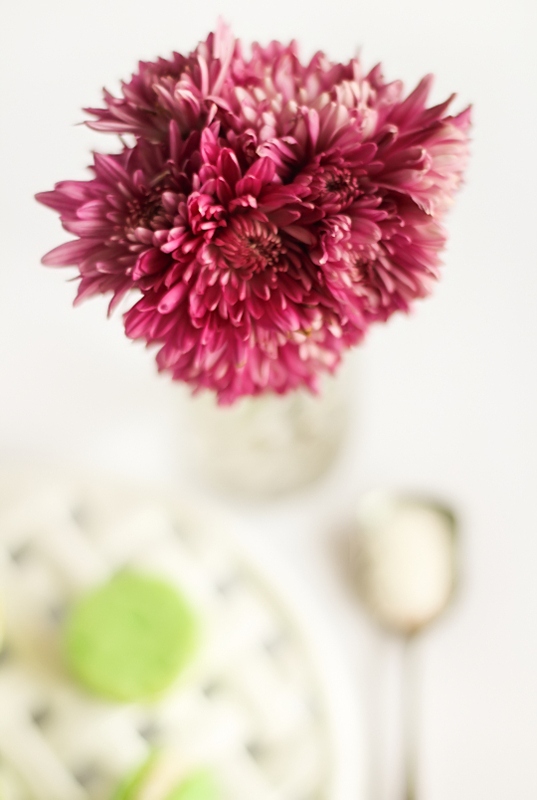 I actually had quite a disappointing experience with my florist/decorators but I won't go into the details. Anyway, it was just great to get back into my kitchen and do some relaxing baking yesterday, after days of running around shopping and sightseeing with my cousins and nights of eating out. I finally started feeling human again once I had my favourite purple silicon spatula in my hand. With all my cousins around my Malaysian accent has come out of hiding, and it seemed appropriate to bake something with a uniquely Malaysian flavour. I have mentioned pandan flavouring many times on this blog, and will use any opportunity to tell others about how awesome it is. 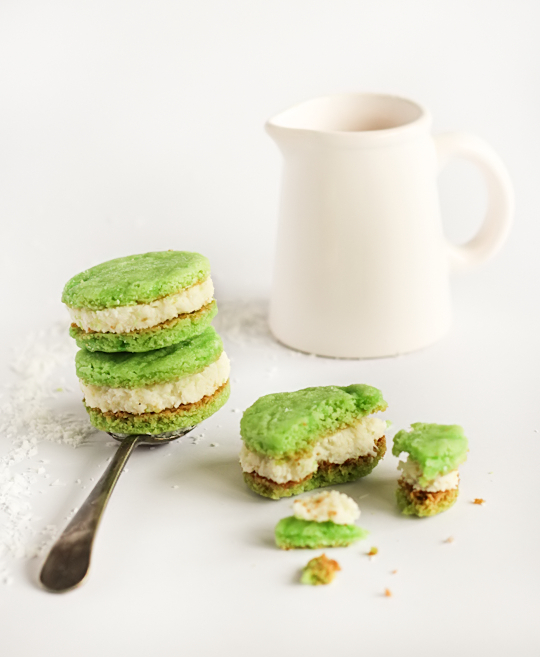 The aroma and flavour of pandan leaf is so pleasant and works so well with coconut, so I decided to make some simple pandan flavoured shortbread and sandwiched a sticky coconut filling in the middle, similar to the filling you get in Bounty or Mounds bars. The cookies are REALLY good, in fact they tasted so good on their own that we polished off half a batch before I made the filling. 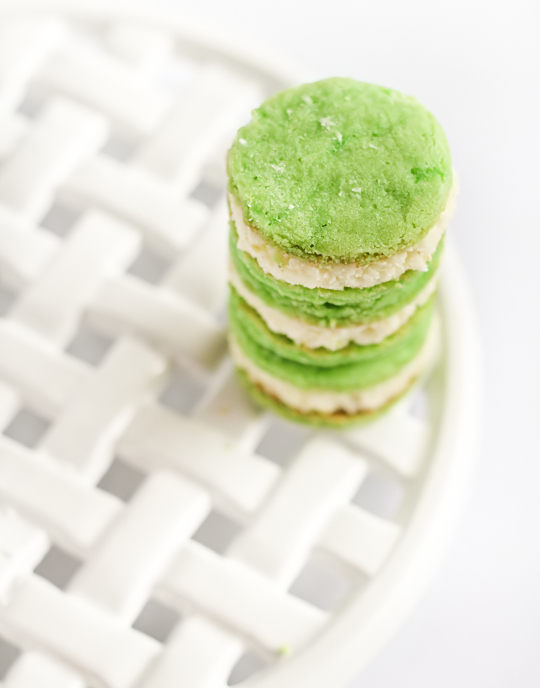 The bright green colour comes from the colouring in the pandan paste, and the strong flavour from the paste combined with a super short, buttery and slightly salty shortbread makes these incredibly addictive. The filling on its own seems pretty sweet, but when you sandwich it between two of these biscuits, it melts in your mouth and it all makes sense. Of course, you have to be a fan of coconut to like these. 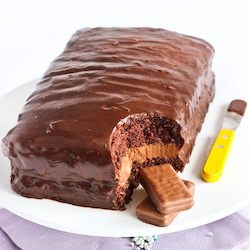 I have had these weird cravings for Bounty bars recently, so I mixed up dessicated coconut, sweetened condensed milk (YUM) and a touch of icing sugar to make this sticky, delicious filling. My one big tip when making these biscuits; make sure you leave the dough to rest for a long time. The more time you chill them, the longer the dough holds its shape in the oven. I was too impatient and baked my cookies too soon, and they expanded heaps and I had to trim the edges to make them neat again. It wasn't too bad a mistake since it meant I had lots of offcuts to nibble on :D Anyway, my life is slowly heading back to normal and I could not be happier. But I'm about ready to collapse from exhaustion, I think it's time for a nap! Prepare the dough well ahead of time; sift flour, bicarb, and salt into a medium bowl and set aside. 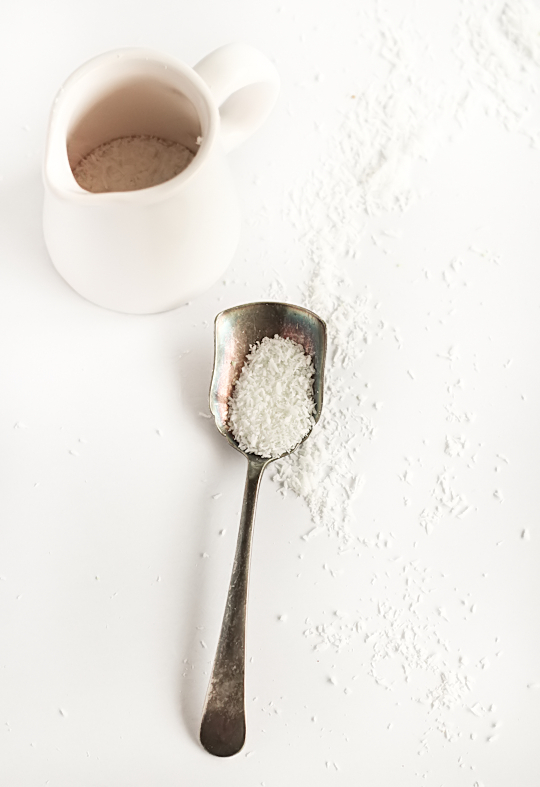 Beat butter and sugar in a large mixing bowl with an electric mixer until light and fluffy, about 3 mins. Add egg yolk and pandan paste and beat to combine, scraping sides and bottom of the bowl to ensure it mixes evenly. Beat in dry ingredients at a medium-low speed until just combined. The dough should be easy to handle and quite firm. Roll dough into 3 separate logs, about 4cm (1.5 inches) in diameter, wrap well in clingfilm and refrigerate for at least 3 hours or preferably overnight. You can refrigerate this dough for up to a week, or freeze it for up to a month (defrost overnight in the fridge). Prepare at least two baking trays with baking paper. Take dough out of fridge and unwrap. If making rounds, use a sharp knife to cut rounds, about half a centimetre thick. Place rounds on dough, leaving at least 4cm space between each one to allow for any expansion. Keep prepared trays in fridge while cutting the rest of the dough. Preheat oven to 180°C (350°F) and bake each tray for 10-14 minutes, or until the biscuits start going brown on the edges. Keep an eye on them after 10 minutes as they will brown quickly after that. Leave cookies to cool on trays for 5 mins and then cool completely on a wire rack. Prepare the coconut filling; place coconut, icing sugar and condensed milk in a large mixing bowl and stir until it comes together and is mixed evenly. If the mixture is not sticking together well, gradually add more condensed milk to the mixture until it clumps easily. Place about 1/2 tsp of filling between each cookie, press together and then store in the fridge in an airtight container for about half an hour before serving. 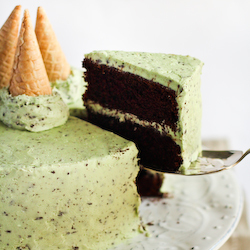 And I never taste pandan cake. Is pandan paste only available at specialty asian grocers or could I find it in the asian aisle at a major supermarket these days like Coles or Woolworths? 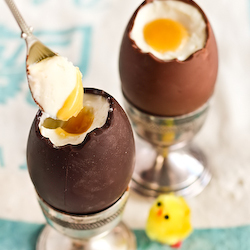 I love the look of this recipe and would love to try it. Please let me know where it is available, cheers, Ruby. Ruby - unfortunately it's not currently available at major supermarkets, I got mine from a specialty Asian supermarket in Cabramatta. You should be able to find it at most of the Chinese supermarkets around, hope that helps! I will be checking first thing tomorrow morning! Thanks so much for letting me know (and so promptly too!). I really appreciate this as I would like to make them if possible tomorrow. What is the minimum time to leave the dough to set in fridge do you think? If i freeze the dough it would hasten it up wouldn't it? Also, why do you refrigerate half an hour before serving? cheers again, Ruby. Minimum time is 3 hours, but like I said it is more likely to expand and not hold its shape the shorter you chill it for. Yep freezing would speed up the process! I chill it at the end to let the filling set and hold the cookie together better. PS. Also, would this dough be suitable to roll out and use a cookie cutter or is it best to do in a roll as you have done? :) Thanks again so much. Ruby. It's easier to do it in a roll, but it's possible to do it with a cookie cutter - see the link at the top of the recipe and you'll see I've done it with with cookie recipe before. These are so unique! Awesome recipe! Wow, those cookies look delicious! That's such a great recipe. They look amazing!! Hmmm pandan, coconut and condensed milk yummmmmm! The cookies look super pretty and I love the color. Sandwich cookies are the best! Thank you so much. This is my first time commenting, but I've been lurking for a while. I am a mexican living in Holland, but my husband has indonesian origins and he is crazy about pandan, coconut and cakes. 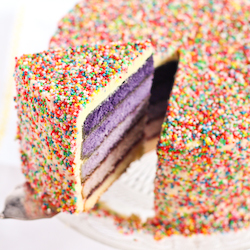 I love your blog and will be trying this,if I manage to get some pandan paste (I can find pandan cake mix easily) but they have pretty big asian supermarkets here, so there's hope . I am a big fan of coconut, and these cookies make my mouth water :) The color of the cookies is fantastic!! I would love to make these! 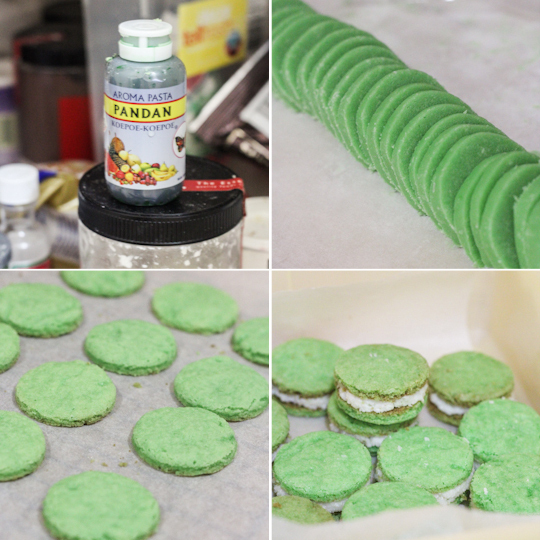 Is there a way to make your own pandan paste? these cookies look just so deliciuos! and the photos are gorgeous! Oh, great post, those cookies look amazing! 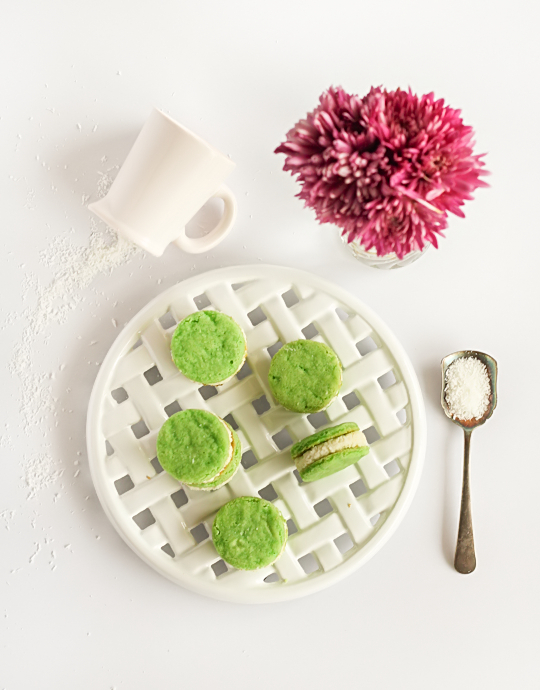 I have never tried pandan, but I keep hearing about it... perhaps I'll have to make these to have a taste! Unfortunately, I don't know many people who like coconut (besides me)... I wonder what other fillings might work? I have a bottle of pandan flavoring at home and I was looking for something to make with it. These look wonderful and sooo pretty.Now I am inspired. Congratulation on your marriage! the colour of the cookies is so bright and pretty! 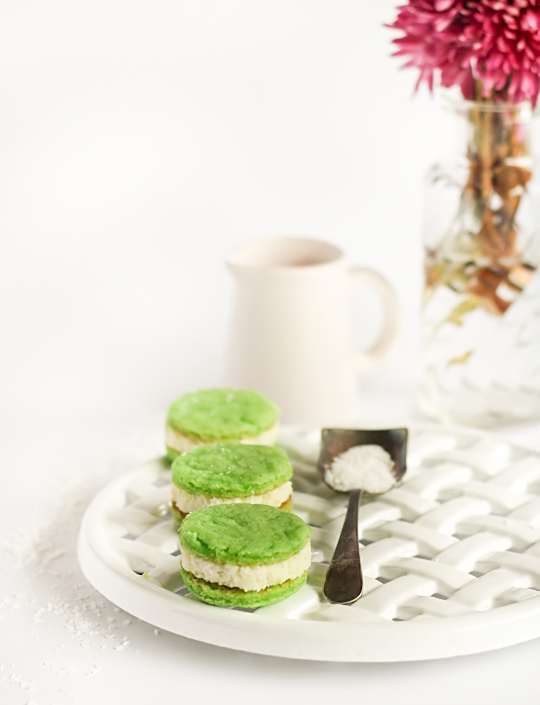 pandan flavoured desserts are delicious! I love pandan. I just made a pandan chiffon cake and I use it all the time when I make rice in coconut milk, with a little sugar it's just like dessert! These look wonderful. I've grown up with pandan flavouring. To me, it's one of those flavours waiting for more people to discover. The flavour is unmistakeable and soooo pleasant. Your cookies look delicious!! I'm unclear about the butter amount. I'm from the US and our sticks of butter are usually 113g each. Are your sticks larger? I'm not sure which number is accurate. Sorry that's probably my bad conversion skills. Go with the 280g, will try to fix up the mistake ASAP. That's what I decided to go with. Thank you!